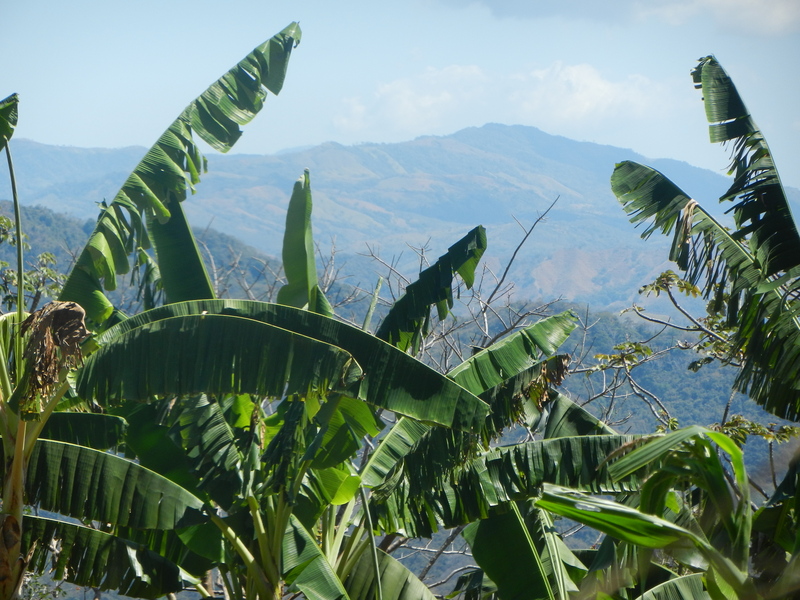 The project was directed by Ruben Medina and Adolfo Salinas Acosta, Mesoamerican Center for Sustainable Development of the Dry Tropics CEMEDE at The University of Nicoya (UNED). 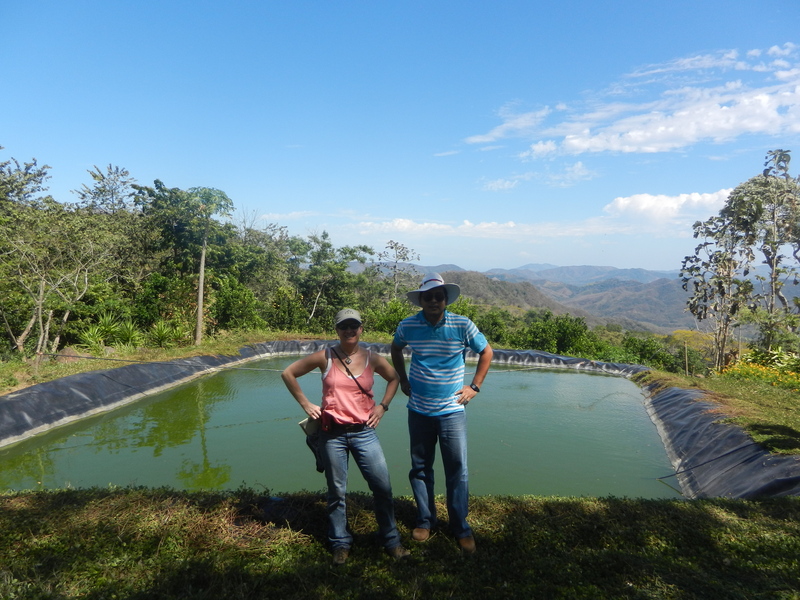 They received enough grant money from Conare (four universities working together) to build artificial ponds/reservoirs in the mountains of Monte Alto, a nature reserve located 480-833 meters above sea level. It belongs to the Nosara Protected Zone above Nicoya. We only had time to visit two communities in this mountain range. There I visited two artificial ponds which successfully held Tilapia 400-1,000. After the rains in January the males are only fished out. The ponds are built above the farmland with an irrigation system, which sustain the agriculture of; forest grown coffee, hazelnuts, tomatoes, chili, beans, peas, celery, green peppers, cilantro, onions, scallions, chives, lettuce and more! I even watched a farmer pull a huge fresh water clam out of a water hole where he was harvesting them. The 5-6 months during the hot, dry season farmers could not have sustained their livelihood and live off the land like they can today. Fish and vegetables are now brought down to be sold in resort and rural communities such as Guanacaste and plenty are provided for the local families who live in these farming communities. Is to share what I believe to be a very successful food security project. 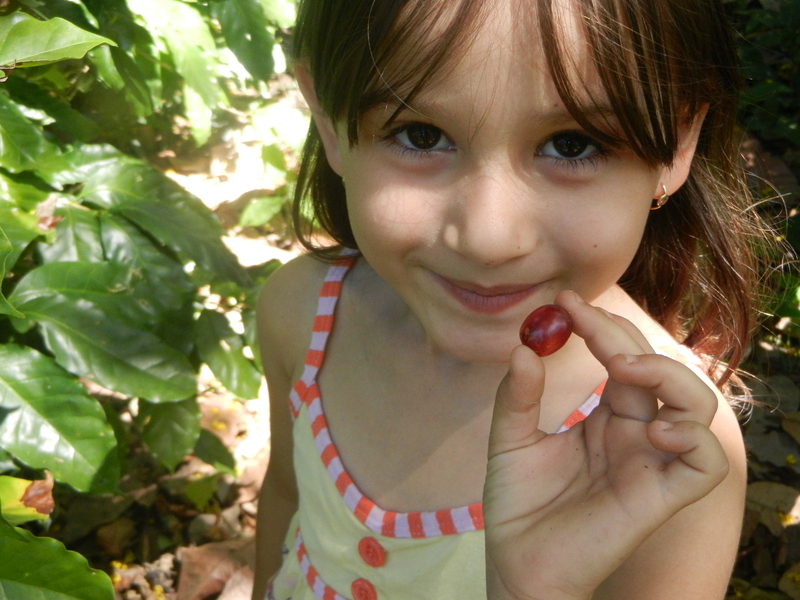 I feel this project deserves the attention of larger agricultural corporations who benefit from Costa Rica’s coffee, produce and possibly farm raised Tilapia. I also believe this project could benefit rural, dry areas of the US. Perhaps in South Dakota or Nebraska. If the people who live and work in these rural communities have an opportunity to have a more diverse and healthy diet because of an artificial pond, I want to help them get there! Please send me your feedback. I would like to know what you think and perhaps any ideas you have to expand this project throughout Costa Rica! I am always looking for volunteers to help me sustain and build Kids Share Workshops Cross Cultural Program in the Americas. Kids Share Workshops supports ideas and projects which benefit the health and well being of children. Cross Cultural sharing and caring brings us all together for the possibility of a brighter future benefiting our communities, country and world! hello Kris, i like very much see this pictures in this blog, greettings…. Thank you so much, Kristina, for following up on my recommendation to contact Rubén. He dreams of a better tomorrow always, and I’ve told everyone who has interest in Costa Rica, or sustainability, about his project. You’re the first U.S. person to follow up, as far as I know! Sharing it with young people in schools is perfect; they will likely have to deal with the issues of food scarcity and sustainability. I’m certainly on board to do what I can as a member of Partners of the Americas. Thank you for shining the light! Thank you Kis,, for your interest in our project. you did a great job with the picture in your blog. and is very nice what you wrote.